While it has been a few years since I found it necessary to take a self imposed respite from my advocacy work, that does not mean that I have not continued to witness the continuing horrors inflicted upon the innocent. Each and every account, each and every horrific graphic image is permanently etched into my psyche and adds to the unhealed scars that remain hidden, adding to the dark cloud that covers my very soul and which has essentially destroyed what little faith in mankind I had left. First a question. Do any of you still feel the knots of frustration and anger when you, as well, continue to witness the many injustices that we are bombarded with daily? Be it the autrocities inflicted upon the human species or the animal species? If you do not, then stop reading this post. We are all aware of the ramifications and negative results of ‘racial profiling’. Judging all by the actions of others, based upon their colour and beliefs. Many likely support that notion, but many do not. This bias is at best, motivated by fear and prejudice, and many around the world believe it to be totally unacceptable. There is another type of profiling that is currently going on in today’s fearful society, resulting in the destruction of innocent lives and which rips at the heart of loving families. Currently Montreal, Quebec, Canada plans to use “Canine Profiling as their bandaid solution to a problem which is not a dog problem, it is in fact a human problem! This planned Canine Profiling is biased and prejudicial, based upon fear and ignorance (at least in this writers opinion). Given that the Animal Legal Defense Fund lists Quebec in the Bottom Tier for Animal Protection Laws, as it has for over a decade, it comes as no surprise that the animals in this province continue to be subjugated. A province well known for it’s continuing puppy mills and apathy. For those of us who remember LENNOX and BRINDIE, for those of us that remember the Whistler Massacre, The Howl Heard around the World, we also remember the sheer anger, our gut knotted in disbelief and total frustration. If you are like I am, each incident, inflicts upon you a striking blow. It is not just the innocent life that has been taken, we lose part of ourselves as well. Canine Profiling does not focus on the real issue. Canine Profiling is biased, prejudicial and based upon the ignorance and fear which is a direct result of the mistreatment, uneducated handling and training of targeted breeds. It is born from the questionable personal agendas and the irresponsibility of far too many “humans” who own targeted breeds. I am asking all of you who continue to advocate and fight for the lives of the innocent, to join us in our fight against “Canine Profiling”. Please help this campaign go viral by sharing. Around the World on this Day, we honor the fallen human heroes who have made the ultimate sacrifice to protect our right to Freedom. We honor those who have survived the unimaginable horrors of War, those men and women who continue to suffer the after effects of the severe trauma inflicted upon them, both physically, mentally and emotionally. It is one day out of 365 when we stop, put aside our own hectic schedules, to acknowledge our War Heroes, our War Dead and their families. To these men and women around the world who continue even today, to make the sacrifices our many Nations call upon them to make in the name of our Freedom and Privileges , I thank you. How many of us around the world are inundated with requests for donations…donations towards conservation, saving wildlife….how many of us have doled out ill afforded dollars believing that our contributions are going to preserve habitat and to save the lives of animals? Well there are so many organizations out there, it is difficult to even keep track isn’t it? We all want to do our part, to make a difference, to do good, to contribute in a most positive way and we should all applaud and be very proud of the contributions which we have made in the past and continue to make. However, a word of warning: BE CAREFUL WHERE YOUR DONATIONS GO!!! Be careful where you send your HARD EARNED DOLLARS, for all is NOT what it appears to be. It has been some time since I last did an update about this amazing, highly (scarily) intelligent boy. Loki’s followers get thier updates on his FB page: I hope you will follow him there. Summer has finally arrived in the Northwest Territories and of course we are all enjoying this long awaited time. Longer day,s higher temps and hours upon hours of daylight. The birds are singing, the wild roses are in bloom, the Boreal Forest is thick and lush and the skies, the most amazing and the clearest of blue. Winters here are too long, too cold and too harsh. Temperatures are brutal, the winds off the Great Slave Lake are fierce and chilling. One thing, if it is extremely cold, we do not get that much snow. A small gift of the heavens to compensate for the extreme and lengthy hours of darkness we experience during winter. We have all had the experience of the horrid emptiness in the loss of a Beloved Animal Companion. It matters nothing whether that companion is a cat, dog, ferret, rabbit, mouse, hamster, or even fish. There is a gaping hole left behind, that can only be filled with the Loving Memories of a life lived well, shared with complete devotion and unconditional love. Until 1999, thousands of black bears were killed when they came out of hibernation in the spring, baited with garbage food and hunted down by dogs. Now black bears will be killed as they come out of hibernation – when they are most vulnerable – when females have nursing cubs. 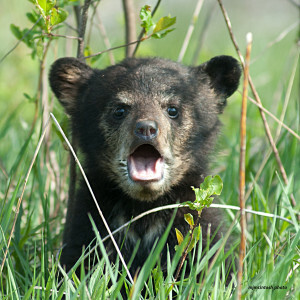 Your vote is needed to prevent Ontario Spring Bear Hunt! It’s important to Vote as our side has moved slightly ahead at this point. Many thanks for the determined Bear advocates out there who found this avenue to Vote after the link on the news page had changed. Thank you Donna for all that you do. Dogs eliminate heat through panting; however if the temperature of the environment is too hot and humid then panting becomes ineffective. Normal body temperature is around 38.5C/101.4F. In cases of heat-stroke a dog’s body temperature can rise in excess of 41.6C/107F. Increased muscular effort displayed during excessive panting can also cause a rise in body temperature. Now if we can get Canada’s Powers that Be to actually take their fingers out of their ears….we have been fighting for this for decades!! So many of you have been following the story of LOKI. 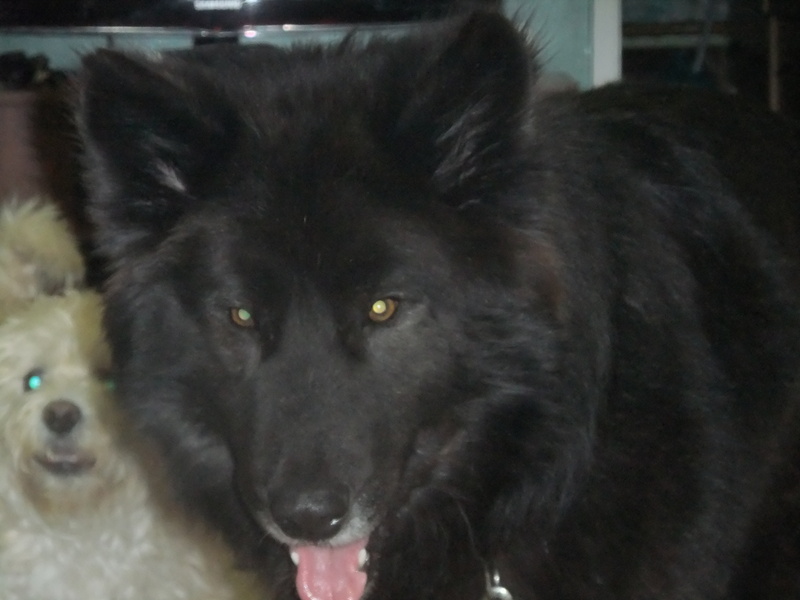 The Sole surviving pup, one of 23 seized in a 2010 hoarding case in Canada’s Arctic.